iStupid, indescreet SSID tool (for the) unknown PNL (on) iOS devices, is a Python-based tool for Linux that allows deleting Wi-Fi network entries from the hidden PNL of iOS mobile devices. For more details see the original iStupid blog post, and it can be downloaded, as usual, from Tadddong's lab. 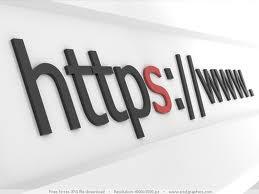 The second requirement is to know the Wi-Fi network security type. A very common scenario for end users is to remember the SSID they connected to and (at most) if it was an open or a secure network. Unfortunately, if it was a secure network, iOS does not help the user to differentiate between the multiple security types, as all them are represented by a lock (see the image above). The loop interval, that is, the amount of time iStupid spends on every security type, can be changed through the "-l" (or "--loop_interval") option. The next blog post in this series will demonstrate iStupid advanced usage through some additional command line switches (check the help with "iStupid -h"), like the one that tries to identify automatically the security type of the original Wi-Fi network. Mobisec v1.1 by default uses Python 2.6.5 and will complaint about not having the "argparse" module. 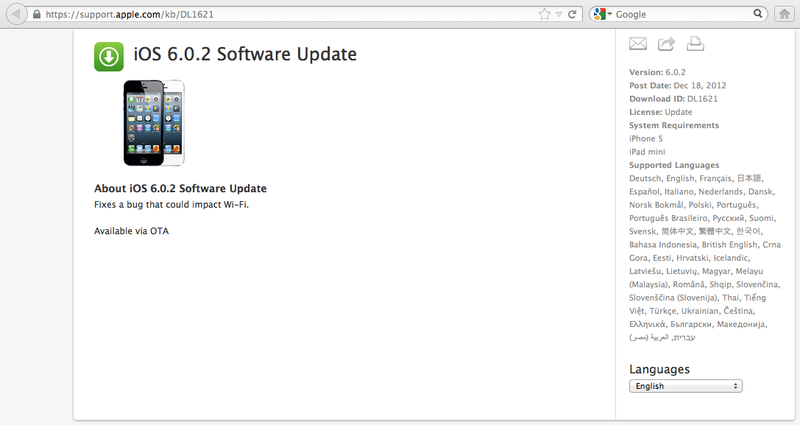 You need to update it to Python 2.7.x in order for iStupid to work. Unfortunately, the existence of other vulnerabilities where mobile devices disclose their PNL in the air (specifically TAD-2013-001 for iOS devices; see note below) makes mandatory to have capabilities to manage the PNL (view, add, delete, and edit PNL entries) in order to be able to check and increase the security of Wi-Fi clients. 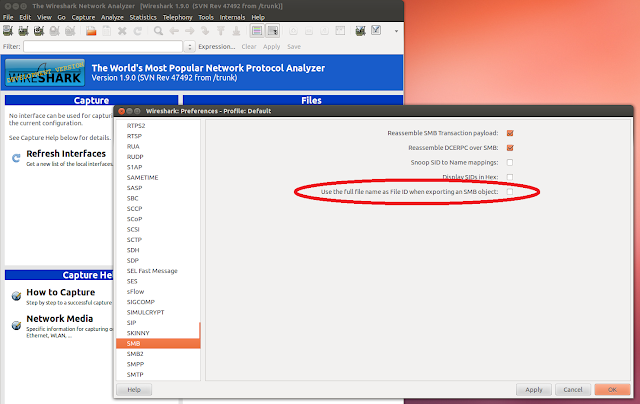 Besides that, the PNL management capabilities should also allow the user (or security administrators) to easily define the connection priority order when multiple known Wi-Fi networks are available, plus allow defining if the client should automatically connect to known Wi-Fi networks, being able to disable or configure that behavior per network individually. Additionally, it would be very interesting for mobile vendors not to force the user to have to enable the Wi-Fi interface in order to be able to manage the PNL (and change or configure other Wi-Fi settings), as the device might temporarily be exposed unnecessarily until a secure Wi-Fi setup is completed. iOS mobile devices allow to easily add entries to the hidden PNL: every time you connect to a new network. 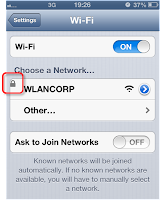 However, the user cannot remove entries from the hidden PNL unless the Wi-Fi network is in range. Only if the user is in the area of coverage of the original Wi-Fi network, by selecting the blue arrow button available at the right of the network name, the "Forget this network" option will be available, which allows removing the network from the hidden PNL... WTF! 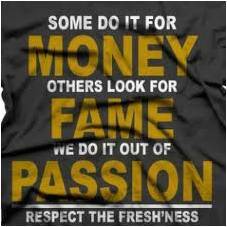 (Without Traveling Faraway... where the original network is really available). Trying to overcome this limitation in iOS devices, we thought about developing an iOS app (mobile application) to be able to manage the PNL. However, as you can see on slide 12 of my RootedCON 2013 presentation, for non-jailbroken devices there is no iOS SDK public API (or library) that allows accessing the PNL. Therefore, iStupid is NOT an iOS app :( Please, do not confuse the iStupid security tool (Python-based) with the iStupid app (entertainment) available on the Apple Store since 2010. 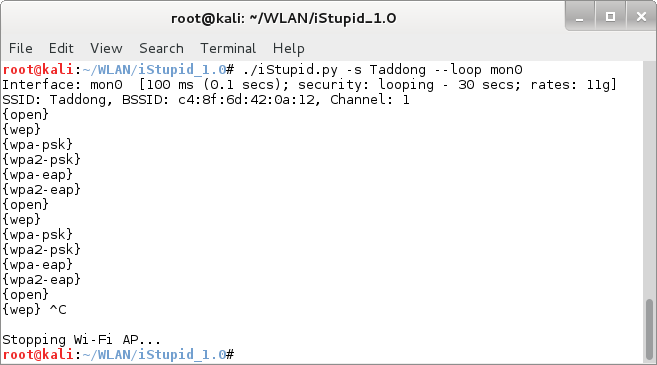 As a result, the other alternative I came up with was to develop iStupid, indescreet SSID tool (for the) unknown PNL (on) iOS devices, a Python-based tool (for Linux) available in Taddong's lab starting today (v1.0). It generates Wi-Fi (802.11) beacons frames for one or multiple SSID's, so that a previously known Wi-Fi network is available here and now and, thus, can be easily removed from the hidden PNL of iOS mobile devices. The tool provides multiple configuration options for the advanced user (check the help with "iStupid -h"), such as selecting the Wi-Fi network SSID, channel, BSSID, beacon interval, 802.11 rates, security settings (Open, WEP, WPA(2)-Personal & WPA(2)-Enterprise), and much more. Future versions of the tool might include an option to perform dictionary and brute force Wi-Fi network impersonation on the SSID, and potentially, support for other operating systems, such as Mac OS X (as there are lots of iOS mobile device owners that are Mac OS X users). Mobile devices perform network identification, that is, they consider a currently available Wi-Fi network to be the same as a previously known Wi-Fi network, based on two factors: the SSID (or network name) and the Wi-Fi network security type. During my initial testing I discovered that for iOS mobile devices it is not relevant if the network is based on WPA or WPA2, or if it uses TKIP or AES-CCMP. 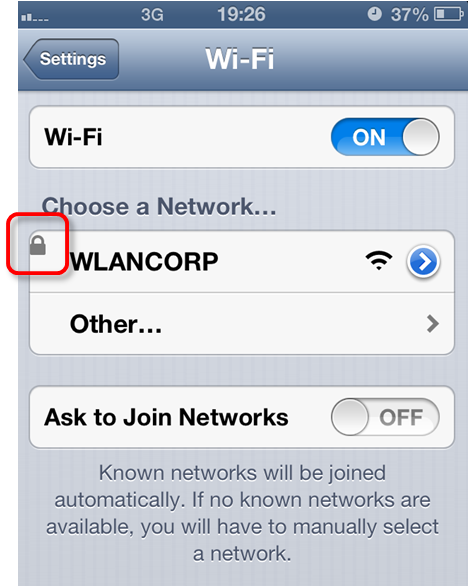 iOS allows the user to remove a WPA2 network from the PNL even if it appears as WPA, and viceversa. The version I showed at RootedCON (v0.9) has been slightly improved by version 1.0 with additional capabilities that are detailed in the two upcoming Taddong's blog posts: "iStupid: Setup & Basic Usage", and "iStupid: Advanced Usage". NOTE: I'm wondering if the recently published press release covering this PNL disclosure issue on modern mobile devices will finally help to motivate vendors to fix it? Am I holding my breath? No. 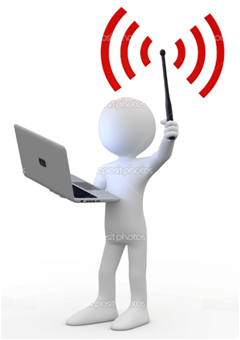 How To Add Wi-Fi Networks To Mobile Devices? One of the first things I learned during my recently published Wi-Fi security research is that mobile vendors do not read Taddong's Security Blog ;-) During the RootedCON2013 conference celebrated in Madrid last month, March 7-9, I talked about the still prevalent Wi-Fi weaknesses, or vulnerabilities (depending on how relevant you think they are), in mobile devices. The full presentation, called "Wi-Fi: Why iOS (Android, and others) Fail inexplicably? ", has been published in Taddong's lab, and by the RootedCON organization (check the other great presentations too). The minimalism applied to the user interface in mobile platforms clearly impacts, still nowadays, their Wi-Fi capabilities and security stance. In 2010 I published a Windows Mobile 6.5 vulnerability in its indiscreet Wi-Fi interface (TAD-2010-003) in which the "This is a hidden network" configuration setting didn't have any effect. In the same way this setting existed since the Windows XP SP2 days and through all the subsequent Windows versions (Vista, 7, 8…), it was not working for Windows Mobile, so all Wi-Fi networks were managed as hidden and disclosed for free by the device.BTW, this behavior does not affect Windows Phone 7.x or 8. This insecure Wi-Fi client behavior is well known since 2004, when the original Karma-like attack were published (so old that link does not exist anymore :-), and was fixed in 2007 in Windows XP through the KB917021 optional update. Why in 2013 most mobile platforms still expose client devices to Wi-Fi network impersonation attacks…? In 2011 I published a similar Preferred Network List (PNL) disclosure vulnerability for Android 2.x-3.x (TAD-2011-003) depending on how you add a Wi-Fi network to the mobile device: automatically from the list of available Wi-Fi networks (expected behavior) by selecting it, or manually from the "Add Wi-Fi network" button (now the "+" button in Android 4.x) at the bottom of that list (vulnerable behavior, as the network is considered as hidden again). TAD-2013-001: PNL disclosure in iOS 1.x-6.x when adding Wi-Fi networks manually. TAD-2013-002: PNL disclosure in BlackBerry 7.x when adding Wi-Fi networks manually (at least it can be changed afterwards from the advanced Wi-Fi settings, and in particular, through the "SSID broadcasted" option). TAD-2011-003 still applies to the latest Android 4.x versions, and has not been fixed since Android 2.x-3.x (2011). Apart from manually adding new Wi-Fi networks to the device, there are other weird situations where mobile devices might disclose their PNL… by mistake. Mobile vendors need to pay close attention to this issue and avoid their devices became easy victims of Karma-like attacks, where an attacker impersonates the legitimate Wi-Fi network and shares the network at layer 2 with the victim for further attacks (independently of the Wi-Fi network security settings, as there are ways to get the network key just interacting with the Wi-Fi clients). I also suggest mobile vendors to include an option to easily determine if a Wi-Fi network is considered as hidden or not by the device, as we have in the traditional operating systems. This specific vulnerable behavior associated to Wi-Fi clients is reflected in the OWISAM Top 10 methodology, as "OWISAM-TR-009: Client trying to connect to insecure networks". OWISAM is a new Wi-Fi project by Tarlogic that was also presented during RootedCON 2013 (OWISAM). If you are working on Wi-Fi security I recommend you to get involved. The tools I demoed during the presentation, such as iStupid (indescreet SSID Tool (for the) Unknown PNL (on) iOS Devices), will be released in the upcoming weeks. Other mobile device Wi-Fi vulnerabilities that affect Wi-Fi enterprise networks are covered on my RootedCON 2013 presentation (pages 40-60 of 68), and potentially, on a future blog post. Our SMB2 object exporting functionality has been included in the Wireshark development trunk from SVN rev. 48210 on. Source code and binaries for the supported platforms are publicly available at the automated build section of Wireshark. NOTE: As this is a development version, use it with caution. Coincidentally, iOS 6.1 includes a security fix for a DoS Wi-Fi vulnerability (CVE-2012-2619) whose advisory was published on October 23, 2012, by Core Security (including a PoC), affecting the Broadcom Wi-Fi chipset of iPhone 3GS (BCM4325), iPhone 4, iPad and iPad 2 (BCM4329), as well as other Apple and non-Apple mobile devices. 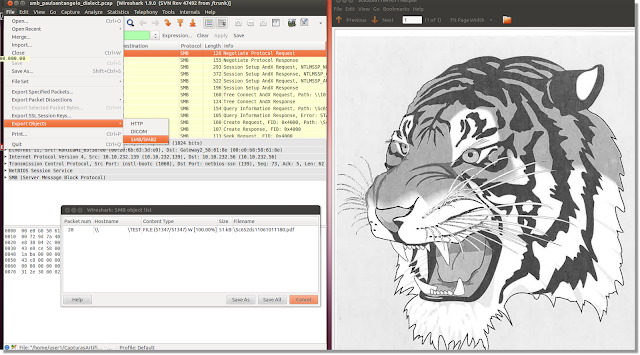 NOTE: This article was cross-posted on the SANS Penetration Testing blog edited by Ed Skoudis. Since the release of iOS 6 last year, Apple has published iOS 6.0.1 and then iOS 6.0.2. The main concern with iOS 6 (Sep 19, 2012) was the huge amount of security flaws fixed on a single version (197), plus the combination of platform changes and security patches rolled into a single update. The iOS 6.0.1 update (Nov 1, 2012) included fixes for four specific security flaws, with their corresponding CVEs, plus other non-security rated bug fixes, like one that improves Wi-Fi reliability for WPA2 networks. And then... iOS 6.0.2 was released on Dec 18, 2012, one month ago today.